O new beloved yarn Lang Tosca, I sing your praises! This was going to be a variegated hat with kitty ears on the top, but it just knitted up too nicely for me to put the ears on! Instead I did a simple bind-off at the bottom in red Lamb’s Pride worsted and called it a day. 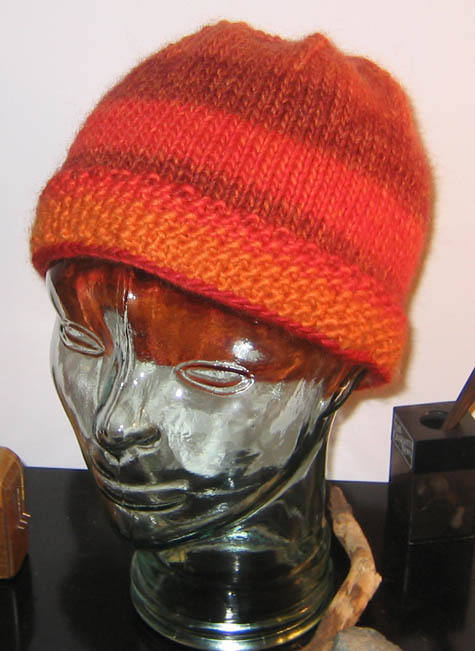 Now I think I’ll knit up a couple of little autumn leaves as an accent pin to go on the brim. I even went back to get two more skeins so that I can do a matching scarf and embroider a tree on the end. Orange looks like crap on me, so I reckon I’ll have to sell this, but I’m still happy! I love it when stuff comes out unexpectedly, but in a good way! Nuts! : I finished knitting up a toddler devil hat for a friend, only to realize that the hat is sized to fit a kid who is probably between 12-18 months. Except that the kid I was knitting it for is four year old. Aw, nuts! Well, somebody will want it. 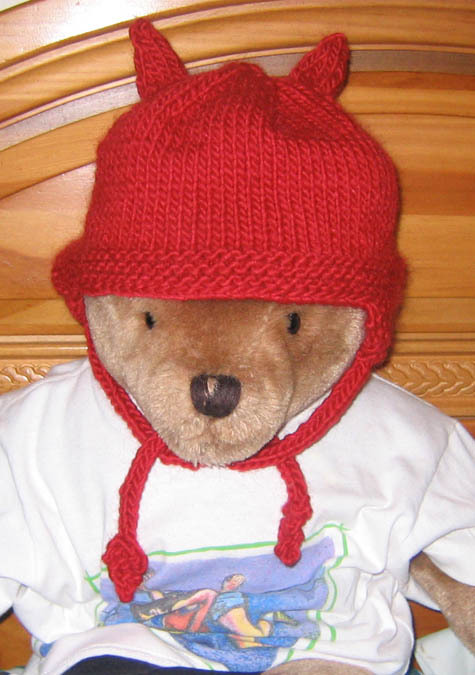 I’ll just do another, since I’ve got plenty of red wool left over. Yay! : My husband, impressed with how well I learned two-handed fair isle techniques to make him the Space Invaders hat, decided to get me something challenging and knitting related. So I got a copy of “Unexpected Knitting” and a video on two-handed fair-isle technique! I learned a LOT from the one minute streaming video that they have on their website, so I’m confident I’ll be throwing with both hands like a pro after seeing the video and practicing a little. I’m very psyched! ETA: Aaaand I have already managed to spill milk on the book, sticking half the pages together. Merry Christmas, everyone! 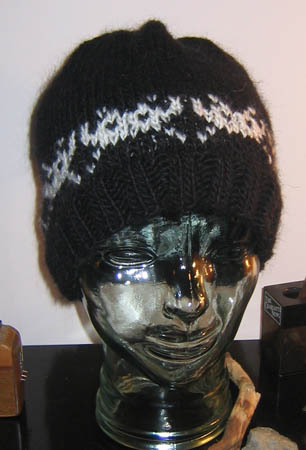 Someone had a pattern up, but I thought the earflaps should be bigger and that it should come in more abruptly at the top, so I made up my own pattern, which I posted in the knitting community here. 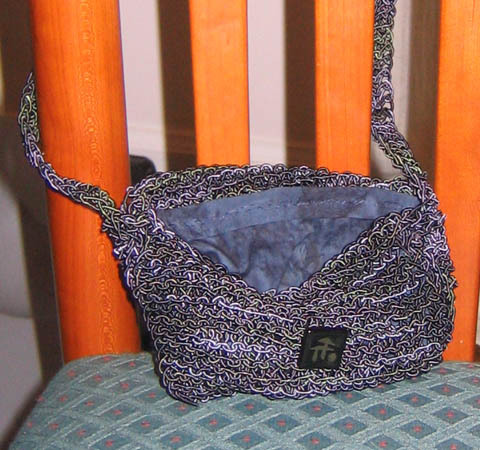 I have finished my mom’s purse. 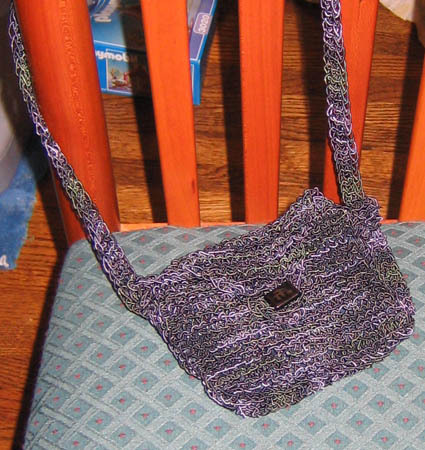 This is a very small shoulder bag, just big enough for her to put a few credit cards and maybe a cell phone in. She wanted a little something for church. I put the lining in inside out from the way I meant to, and rather sloppily to boot. It was late, I was tired. If I never work with Noro Daria again, it will be too soon. I’ll definitely be eBaying (or something) the remaining skein and a half. Pretty stuff, but I never want to see it again. Thus concludes my mandatory gift knitting for 2004. On to 2005! Xposted to knitting and my own journal. I: Load my playlist on random. I: Pick my favorite lines from the first 10 songs, excluding those lines which contain the song’s title. You: Guess what song each line comes from. 1. It’s true today I saw it from the plane/ aeroplanes were never built to fly. 9. If I am dancin’ Roll up the floor./ If I am whistlin’ Whewt me out the door! The bad news: The eyedrops that we got for the cat, the stuff that cost $100.49? It was supposed to be refrigerated. The vet’s office didn’t refrigerate it. So the cat was in medical boarding for the last three days, getting medicine that was improperly stored. This stuff was supposedly critical for the cat to get, and had to be administered every two hours. So now there’s a concern that the cat may not have gotten the full benefit, AND that we wasted our money. The good news: I can be very polite and diplomatic but firm, as anyone who’s dealt with me in Dragonrealms knows. (Okay, actually I apparently am getting a reputation as a pussycat, but I assure you it masks a steely interior.) As a result, the vet refunded the boarding charges for the last visit, bought new medication, and had an employee deliver it to our door, about 20 minutes away from the vet. I believe dropping 2 large on a cat at their facility was helpful to them in making this decision. However, this was absolutely above and beyond. They didn’t have to do this, but they did, and it really turned me around from “severely pissed off” to “happy and smiling.” Kudos, Animal Medical Hospital. Also, their vets say that the medicine shouldn’t have lost too much efficacy over the last 48 hours, although I have a call in to a friend of mine who is a vet who will confirm or deny that for me. The better news: I have made a gift for a friend who has no idea that I have done this, and no idea that it is coming. Doing this always makes me feel somehow giddy and at peace at the same time. I think this person will be very pleased, and that puts a smile on my face above and beyond the usual Christmas cheer. Well, the cat’s ears are doing much better. Another week of twice-daily antibiotic drops and they should be okay. The ulcer on the eye is clearing up too, although now there’s a complication with that. The vet says that the cat has the herpes virus, as many cats do, and the stress to her immune system has caused it to flare up. Dendritic uulcers have formed around the point of the original ulcer. Apparently, when the eye is stained, this looks like little fingerlings radiating out. So now we will have to do drops every two hours for the next 48 hours. And the drops will probably cost 50 to 100 bucks. We have to get them at a regular pharmacy. Because there’s no way we can give her eyedrops every two hours, antibiotic ointment in her eye every six hours, artificial tears every eight hours, and eardrops every 12 hours, she will be boarded again for a couple of days at Christmas. We have passed the $2000 mark on the cat. A cat, I will remind you, which we don’t even like. ETA: The drops came to $100.49. And they have to be kept refrigerated. Yeah, it’ll be a blast putting fridge-cold eyedrops into a cat’s eye. My daughter has some wooden cutout letters that she likes to use to spell things with. Her spelling and reading is great, but the manual dexterity isn’t there, so she uses preset letters to play with a lot of the time. She came running in to me to say, “What did I write?” So I followed her in to see, laid out on the floor, EYE POD. That’s my little Mac geek girl! Just this morning, on the way to take my daughter to school, I commented to my husband that I wished I had someplace to write down all my patterns, because I keep forgetting things like how many stitches to cast on on which needles to make the right sized hat. And what arrives in my mailbox today? Knit: A Personal Handbook! Fresh from my wish list! This thing even has a built in needle sizer and gauge finder! I could not be more psyched! Thank you thank you thank you, chaospearl! You rock the Casbah!